Calcium is a mineral that is important to the body for several reasons, the main one being bone formation. People with inflammatory bowel disease (IBD) are at risk for calcium deficiency, which, in extreme cases, can lead to bone loss. While some calcium loss is common, it's also a problem that is very treatable. It's now known that people with IBD could be calcium deficient, and physicians know to monitor their patients for this problem. 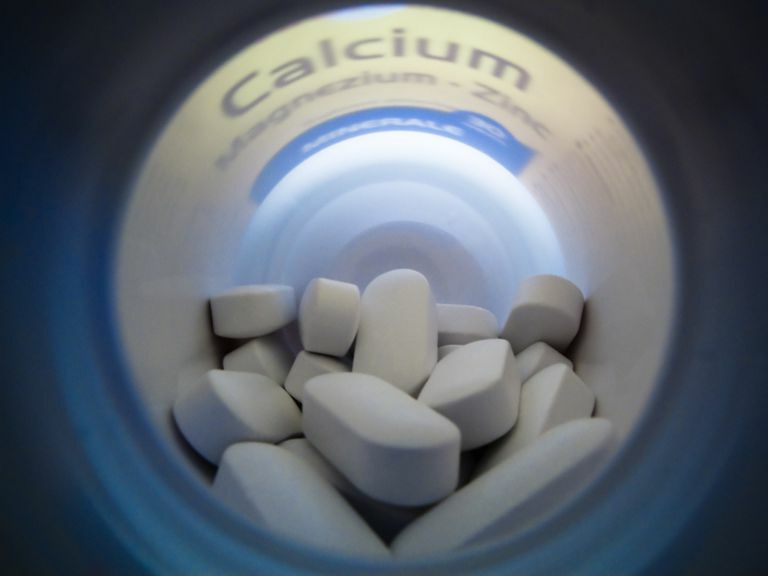 In some cases, a doctor may even suggest a calcium supplement to prevent potential deficiencies. If you have questions about your calcium levels and if your bones have been affected, talk to your doctor. Bone mass is constantly changing through a process called remodeling. During this process, your body breaks down old bone and creates new bone. Without adequate intake and absorption of calcium, bone mass may decrease and lead to osteoporosis. Osteoporosis is often referred to as "the silent thief" because there are almost no outward symptoms. In children, this risk is very serious, as calcium loss can lead to stunted growth. Vitamin D, a fat-soluble vitamin, is necessary for calcium to be used by the body. People with IBD are also at risk for a deficiency in vitamin D.
After bone formation, the second highest use of calcium in the body is in teeth, as the mineral is what makes your teeth hard. Calcium also supports your jawbone and prevents teeth from becoming loose. Other uses of calcium by the body include regulation of muscle contractions, blood clotting, the transmission of impulses through the nervous system, the secretion of some hormones, and the function of certain enzymes. The body cannot make its own calcium, so it must be taken in through foods. If it doesn't have enough calcium, the body will break down its own bone in order to obtain this important mineral. Most people are able to get enough calcium from food, but some may need to take supplements. An inability to absorb enough calcium is one reason why people with IBD may experience calcium deficiency. Malabsorption occurs mainly in people with Crohn's disease where the inflammation is located in the small intestine. Calcium is absorbed in the small intestine, so people who have ulcerative colitis, which mainly has inflammation in the large intestine, may have better calcium absorption. Another reason for the loss of calcium is that prednisone, a common corticosteroid drug used to treat IBD, interferes with calcium absorption. Prednisone also acts to break down bone and prevent new bone from being formed. By both inhibiting your body's absorption of calcium and preventing the creation of bone mass, long-term use of prednisone can lead to significant bone loss. Tests such as bone densitometry can be used to determine the extent of any bone loss and then a physician can prescribe a treatment. Finally, many people with IBD may discover that they cannot tolerate milk, a readily available source of calcium, due to either lactose intolerance or a food sensitivity. Lactose intolerance frequently leads to calcium malabsorption. To prevent bone loss from calcium deficiency, calcium supplements or increasing your intake of calcium-rich foods may be recommended. Calcium needs vitamin D to do its work, so a diet rich in vitamin D or a vitamin D supplement may also be necessary. Check with your doctor to determine how much calcium you need daily and whether you need to take any supplements. Crohn's and Colitis Foundation of America. "Extraintestinal Complications: Bone Loss." CCFA.org 1 May 2012. 29 Aug 2012. Office of Dietary Supplements, National Institutes of Health. "Dietary Supplement Fact Sheet: Calcium." National Institutes of Health 9 Jul 2009. 6 Oct 2009. Ton FN, Gunawardene SC, Lee H, Neer RM. "Effects of low-dose prednisone on bone metabolism." J Bone Miner Res 2005 Mar;20:464-470. 6 Oct 2009.